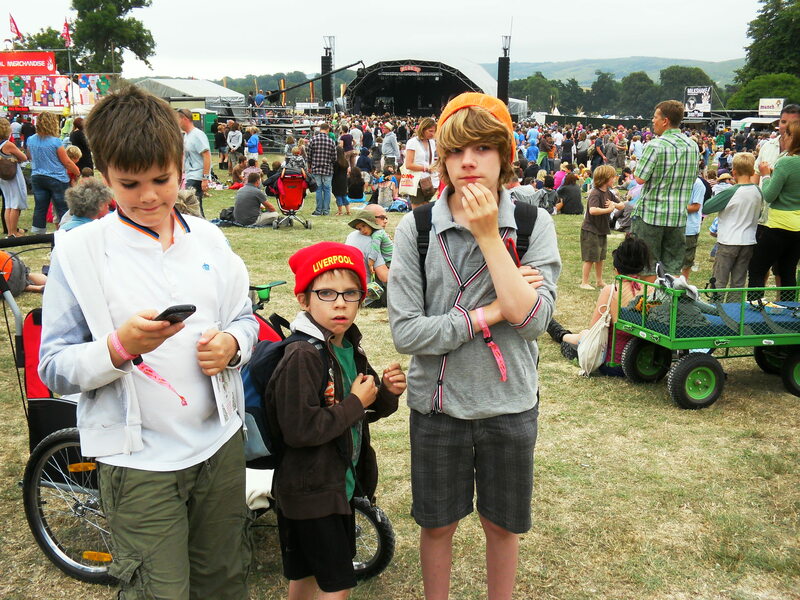 ← Camp Bestival: a 12-year old’s music review. Would you give your 11-year-old a mobile phone? GOING through the holiday snaps stored on various cameras I noticed a theme: Dougie is playing with his mobile phone in almost every photograph. This was to be expected. Giving an 11-year old his first mobile phone and then not letting him fiddle with it for the next month is like giving a puppy a chew toy he can’t bite. If, like us, you are taking the plunge and getting your pre-teen a phone as secondary school and new independence looms, then don’t leave it until September. Get it now and they’ve got the rest of the holiday for the novelty to wear off. There’s legitimate research that says children shouldn’t be holding mobiles to their ears as their brains are still growing, and they are more susceptible to the radiation emitted. There’s also fears of them being more open to mugging, bullying and generally spending too much of their time and our money. We parents can argue that we grew up fine without mobiles, but we also grew up with smoke-filled homes and no seat belts in our cars. We need to accept that times have changed, and mobile phones are both a noisy, expensive curse and an utterly brilliant way of keeping tabs on our children. Trust me: that phone isn’t really for him, it’s for us. Last year we went through the whole hand-wringing over mobiles with our eldest son before he went to secondary school. Back then, a whole 12 months ago, it was easy to buy a bog-standard, no-one-would-want-to-nick-it model, which Jed bored of quite quickly and only uses to write illegible texts to his friends on. I pay £10 a month for credit on a pay-and-go basis– no negotiation – after advice not to sign a kid up to a contract. Getting a free texts/limited calls sim card is advisable, as they won’t spend much time talking on it. However, phones have come a long way in a very short time. They are far more sophisticated, and even getting a cheap one meant touch-screens, android technology and social networking built in. It’s a job to even work out how to actually make a phone call on the blinkin’ thing. Much to the annoyance of Bloke and I, Doug’s bargain phone is better than our contract ones. And no, we are not going to join the herd and hand over any money to Apple. Iphones are so last year. Dougie is a techno fiend. Within minutes of its first battery charge he’d entered all his mates’ numbers, sent us all texts, downloaded a game, set his ringtone and transferred all his music files. I fear the novelty may never wear off. I’ve already wrenched it from his sticky mitts, usually when he’s engrossed and ignoring everything around him, like walking into the road. I need to stem his addiction now before he gets it confiscated during his first week of school. After all, it’s no good to me as a tracking device if it’s in a teacher’s drawer. . .
Well, I for one have had a cell phone for one year now. I first got mine when I was sixteen. When cell phones became popular around school, I was in…mmaybe 5th or 6th grade? Kids would walk around with them and then they would brag or ask, “where’s yours?” I always answered with the same reply, “I can’t get one until I get a job…” Right now, I don’t have a job but they got one for me because I began to drive. It’s ridiculous for me to see children walking around with f’ing Iphones because what do they do with them? What do they need it for if they’re constantly by the hip of their guardian? I know that the world has gotten slightly creepier than it has in the past, but still. I’ll end up giving my kid a cell phone when they’re at least eleven or twelve. I won’t apply texting on it until they hit sixteen either. (While I’m at it, I have to admit that I’m completely addicted to texting. 16,000 text messages a month doesn’t come from space. I am cutting back though! Hooray, haha. 11 years old – no, but maybe when he hits secondary school. It’ll not be cutting though. I think you just beat the world record for the use of the little – dash character thingy – I had a go at counting them all, but they seem to grow by one every time you try. Wise move not getting a contract phone. I’ve crossed swords with my two for exceeding text and minute limits loads of times…pay as you go sounds like a lot less stress. Hyphens. Yes . . .but less annoying than dotdotdot . . .